Today we take a look at the sneaker world’s most popular collaborator Ronnie Fieg’s newest project with New Balance. Not a ton of details are known about the release yet but Ronnie just put up a front view on Instagram stating “salmon soles”. The shoe features the premium materials and color pop we have come to expect from his releases and the 1300 model is the lucky one to get “fiegstepped” this time. The 1300 is a premium model and Ronnie’s self proclaimed favorite model of all time. 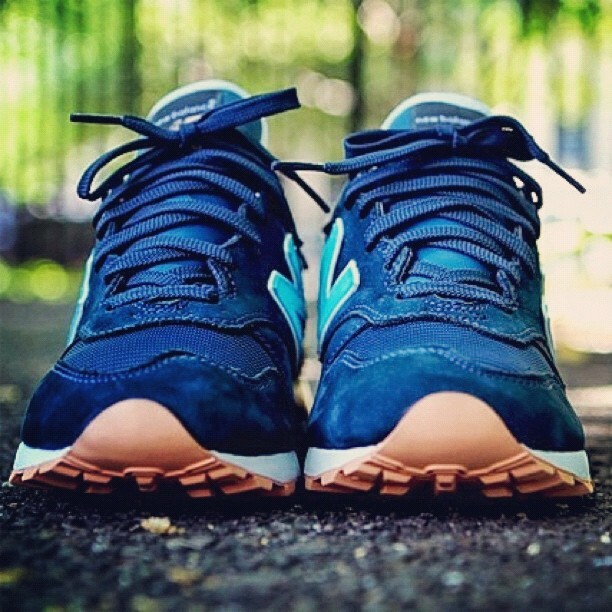 He used the steel blue colorway as the inspiration for his last New Balance collab 999. Sitting on a salmon colored sole the upper features a primarily navy suede upper with a cove blue logo hit. A white midsole and liner add a little contrast and complete the look. After being told that the “N” logo is indeed a cove blue I have come up with some speculation as to the design inspiration. Given the time of year and the colors being used I feel this shoe is a tribute to Fieg’s past releases of Cove and Salmon Toe GL3s. Both shoes dropped in September of 2010 and 2011 respectively. Given the past pattern of Kith releases it can be expected that this new iteration will drop in the next 2 weeks or so. Is a Kithstrike on the way? Stay tuned to @kithset and @ronniefieg on twitter and be ready!